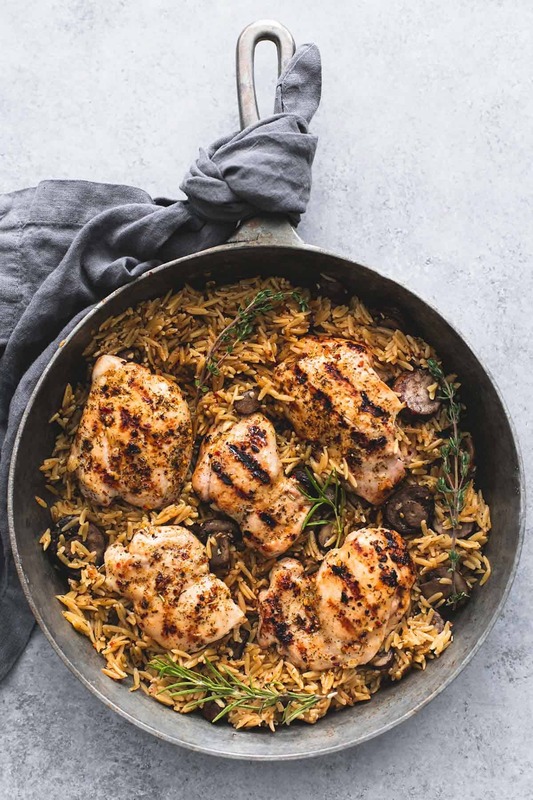 Simple ingredients bring this incredibly flavorful one pot mushroom herb chicken orzo together in just 30 minutes. Let’s discuss the magic that is One Pot Meals. Those three words are a busy cook’s dream. Minimal prep, minimal cleanup, maximum deliciousness. The words “one pot meal” make me one happy camper you guys. And speaking of being a happy camper – after much deliberation I’m very very excited to say that we are in the market for a little camping trailer (YAYYYYYY – please picture me clapping my hands like a six year old) and I’m making a bucket list of places we can take our little crazy family so if you are in the Utah area (and surrounding states… and not-so-much surrounding states….) tell me all the places we MUST take our little soon-to-be camping trailer. Beautiful hiking and/or biking trails are a must, bonus points if there is a gorgeous lake nearby. s p i l l.
This one pot meal is very flavorful, easy (as all one pot meals should be) and healthy <—more bonus points happening here. You could easily swap out the seasonings for your favorite store-bought herbed seasoning mixture, but I really love the combination of flavors in the recipe so you absolutely cannot go wrong with my list of ingredients. It may seem like a lot at first glance, but they’re really just common spices and I can almost guarantee you have all of them in your pantry right this minute. 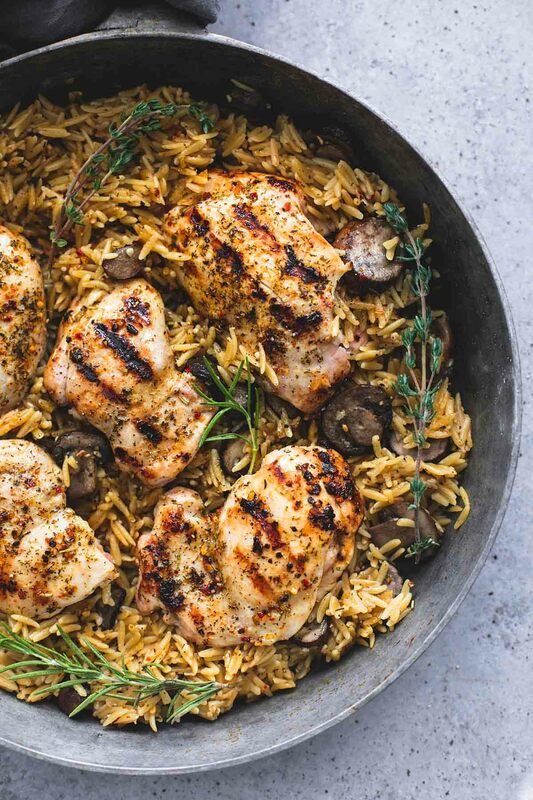 With that being said, there is no excuse not to make this one pot mushroom herb chicken orzo this week! P.S. if you are not a mushroom person, I get it – my husband hates them – they can easily be picked out OR you can skip them altogether and the meal will still be spectacularly delish. Whisk together garlic powder and next 7 ingredients (all of the seasonings). Season chicken on both sides with some of the seasoning mixture. Reserve the rest of the seasoning, you'll use it a later step. Drizzle a large pan or skillet with oil and brown chicken over medium heat (about 2-3 minutes on each side). Transfer to a plate and cover to keep warm. Add orzo, mushrooms, sundried tomatoes, and remaining seasoning mixture to the pan. Stir over medium heat 2-3 minutes until fragrant and orzo is browned. Stir in chicken broth. 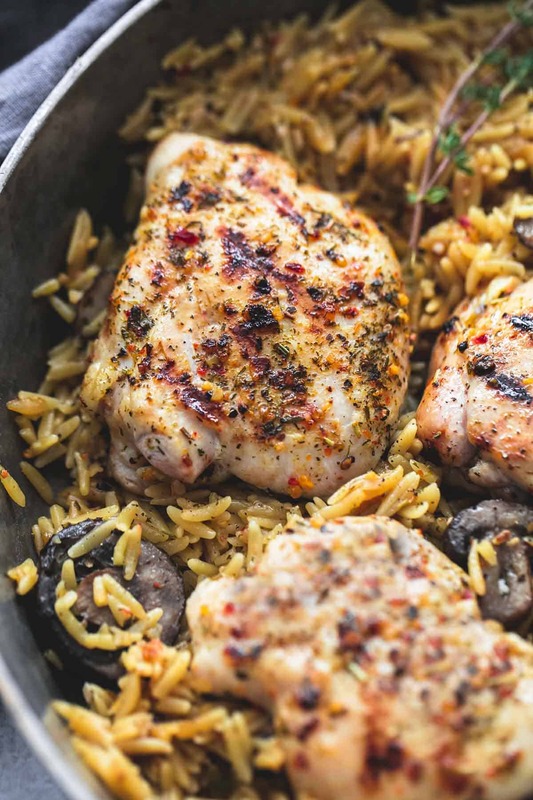 Add chicken to the pan (on top of the orzo and mushrooms), cover and cook over medium-low heat for about 20 minutes until liquid is absorbed, orzo is tender, and chicken is cooked through. Top with fresh-squeezed lemon juice and garnish with fresh herbs (such as oregano and rosemary) if desired and serve hot. Hey Tiffany! This looks absolutely amazing; I can’t wait to make it! One question though, and I’m probably just being a bit dumb—I don’t understand the chicken options: 4-6 thighs or 4 thighs sounds like almost the same thing to me? Unless you only pound them to even thickness if there are only 4?? Sorry if this is really obvious! This sounds yummy but my husband doesn’t like chicken thighs. Can this be made with chicken breasts if I pound them & will it still be moist?? A++++++++ mu husband even said “this is good” before I could even ask what he thought! I had to make a couple of little changes to mine due to lack of ingredients.. changed the parsley to basil and added some fresh tomatoes when I put in the mushrooms since I didn’t have sundried. I did also use about 1/2 c. white wine and 1.5 cups of chicken stock… It really was very very good!!! And, you need to come go camping at Rocky Mountain National Park. You can stay in Estes Park and take a drive up into the National park itself. Absolutely gorgeous!! Hi Tiffany, I made this dish this evening for dinner for my mum, her friend and myself. It was absolutely delicious – thank you so much!! Our only comments were that it was probably a little too lemony (I used the zest of a whole lemon and a hearty squeeze of juice, which was a little overzealous in hindsight! 😅), and that it only stretched to three good portions, so we would maybe add more chicken and/or some more orzo next time. I used a whole onion and a few garlic gloves in place of the ground herbs/flavourings, too. I have all the ingredients for this! Just wondered – when are the sundried tomatoes added in? It doesn’t say in the instructions? And it says add the next 8 ingredients after the garlic powder; I only count 5? Thank you! This looks scrumptious! One question….when you say to whisk the seasonings together and you say the following 8, does that include the sun dried tomatoes?